SINCE BAGGING A frankly absurd number of goals earlier this season, the British media have been falling over themselves to heap praise on Jamie Vardy. His rise from semi-professional football to England international and Premier League top goalscorer has been quickly mythologised. His story has become the stuff of folk story and fairytale: he’s Charlie Bucket who found his golden ticket in a Gregg’s pasty; he’s Jack who swapped his family cow for an 11-game scoring streak instead of magic beans; he’s the goose that laid a golden egg while wearing an ankle monitor. Vardy is certainly worthy of his plaudits and while his vertiginous ascent may yet culminate in a starring role in France this summer, he’s not made it to the summit just yet. Nor is he the first late bloomer to take a circuitous route into top-level football. To find out just where his story can take him, he could take a look to Italy to find someone who made it further up the beanstalk than Vardy has so far. 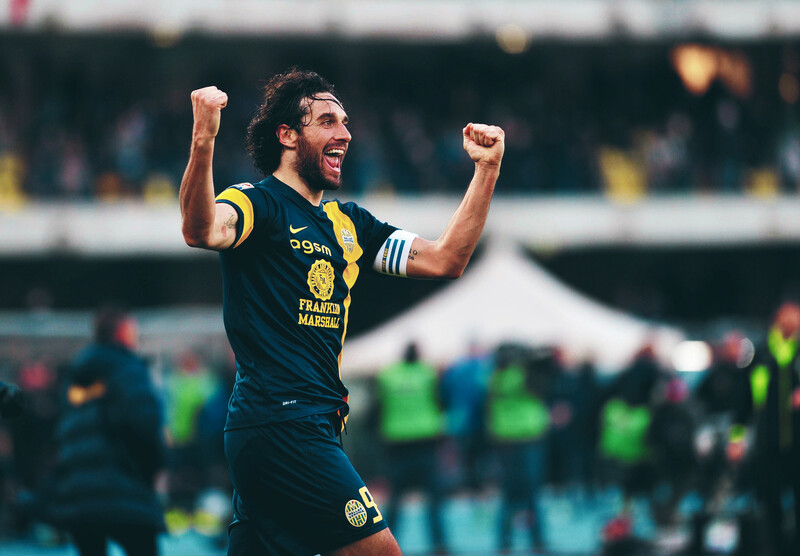 At the beginning of December, Luca Toni announced that he would retire at the end of the season. It marks the end of a long and successful career, but one that is more unorthodox than you might think. Toni had a nomadic early career. He made his debut for Modena at 17 and stayed there for two years. After that, he drifted between clubs, an iron-jawed vagabond of the lower reaches of Italian football never staying longer than one season anywhere. Following six years flitting between Serie B and Serie C1, the new millennium heralded change and opportunity for Toni, as he joined Vicenza and had his first crack at the highest level. It didn’t take him long to find his feet. In just his second match he scored against Atalanta, and went on to bag another eight goals in an impressive debut Serie A season. It wasn’t enough to keep Vicenza up and Toni duly jumped ship to join Brescia. Playing alongside the esteemed Roberto Baggio perhaps rubbed off on Toni as he scored 13 goals becoming the club’s top scorer and leading them to a comfortable mid-table finish in the process. It seemed like he was establishing himself as a contender in the top flight after struggling to make it to that level for so long. Next season, though, the goals dried up and Toni managed to score just twice. His itchy feet got the better of him and he was on the move once again, this time to Palermo. On the surface this seems like it would be a slightly backwards step. True, Toni had struggled for goals in a Brescia side that had spent the previous year battling relegation, but prior to that he had two successful goalscoring seasons. Surely he had enough pedigree to gain a move elsewhere in Serie A, rather than moving down to a second-tier team? And, at the age of 26, was he wasting a year of his prime by not playing at the highest level? By night, red-hot veins of magma ooze from the top of the Mount Etna like jam from the centre of a doughnut, illuminating the Sicilian skyline. By day, though, Luca Toni was equally luminescent, obliterating records and his opposition as he scored 30 goals for his new side as they were promoted out of the second division. Any doubts about this being backwards move were quickly dispelled. His time in Sicily seemed to give his career the upwards momentum he needed – if he had previously been dormant, he was about to erupt. The change in league status didn’t seem to affect him, nor Palermo. He registered 20 goals and his team finished sixth in their first Serie A season ever, placing comfortably above more established names like Roma, Lazio and Fiorentina. The latter had an abysmal season, finishing 16th and avoiding relegation only by virtue of their goal difference. Something had to change for La Viola, and they knew just the man to spearhead it. Toni, ever lured by the potential of pastures new, was convinced to swap pink for purple. It proved to be a masterstroke. More records and opposition defences were left in his wake as he caught fire and set the league aflame. Fiorentina finished fourth and he scored 31 league goals, becoming the first player to score more than 30 since Antonio Angelillo did it for Internazionale, nearly half a century prior. It was enough to secure him his place in history as the first Italian player to win the European Golden Shoe – perhaps the equivalent of the glass slipper in Luca Toni’s Cinderella story. On the back of three excellent seasons it seemed inevitable that he would have a spot in Italy’s 2006 World Cup squad. He was in good company, competing for a place with more esteemed colleagues such as Francesco Totti, Alessandro Del Piero, and Filippo Inzaghi. But he impressed, holding the others at bay to start almost every game in the tournament, crowning his efforts with a brace against Ukraine in the quarter-finals. The first was a typically Luca Toni goal – writhing past his marker to stoop low to meet a Totti cross with the back of his head. It’s a wildly unattractive finish but undeniably, horribly effective. It was a nosebleed-inducing ascent for Toni. Two years earlier he’d been a second-tier footballer. He’d gone from going from playing in front of fewer than 2,000 people at Lodigiani to starting in a World Cup final that ended with him wrapping his hands around the Jules Rimet trophy, all in the space of six years. His rise to the absolute pinnacle of the game makes Vardy’s odyssey seem like a trip down the shops to pick up a pint of milk by comparison. But where do you go when you’ve reached the top? It seems there’s only one direction you can travel in. It’s easy to forget that the 2006 World Cup was done in the shadow of Calciopoli. The investigation clearly provided a rallying point and created a sense of unity for players whose clubs were under scrutiny and whose futures were in doubt. In the wake of the World Cup, five clubs were charged for their involvement in match-fixing. Fiorentina were spared the ignominy of relegation, unlike Juventus, but still had to start the season with minus 15 points. It was a daunting task. Despite rumblings of unhappiness, he stayed in Florence and had a good, if slightly unremarkable season. Fiorentina managed to overcome their significant point deficit to finish sixth in Serie A. Something wasn’t right though, and Luca Toni’s wanderlust kicked in again. Fr the first time, he was going to play outside of his native Italy. He was presented at Bayern in a press conference alongside Franck Ribéry, who had recently signed from Galatasaray. Looking at the pair of them, you can’t help but feel that there’s an odd duality there – they are both Beauty and the Beast. Off the pitch it’s clear: one’s a raven-haired marble statue of a forward, while the other is a sunken-eyed, scar-faced diminutive winger . On the pitch, however, roles are reversed – Ribéry is fleet-footed and nimble; Toni is bumbling and ungainly moving around the pitch. Between them they wreaked havoc on the Bundesliga. Ribéry provided amply and Toni glutted himself on the Frenchman’s service. He finished with 39 goals in all competitions, with another couple of top scorer awards for his mantelpiece back home. Much like at Fiorentina, he followed up an outstanding campaign with one slightly hampered by injuries but he still managed to contribute decently in his diminished number of appearances. The following season, 2009-10 was shaping up to the be first time the Italian had ever spent more than two seasons at one club. It looked like he had finally settled into a comfortable groove. Then something changed. That thing was Louis van Gaal. The club had spent a lot of money bringing in Arjen Robben and Mario Gómez and the competition for places in Bayern’s attack was fierce. Toni found himself out of favour – not just in terms of team selection, but with the manager more generally. As Victor Valdés can attest, van Gaal is not above freezing out players who he deems surplus to requirement and it’s advisable to pack a scarf because his shoulder can be particularly cold. There was an impasse between the two and something had to change. The striker was packed off on loan to Roma for the rest of the season, where he failed to impress for large spells. At this point, things seemed to stall and it was the beginning of another itinerant spell for Toni: free transfers to both Genoa and then Juventus failed to result in success and after a year with the Bianconeri, he was on the move again – this time to Dubai, to play for Al-Nasr. It seemed to be the first signal of a career that was beginning to wind down. It was not a happy period. He was 35 and this move to the lone and level sands of UAE seemed to be an exile, an opportunity to observe his shattered visage, a chance to look upon his works and despair. It’s unsurprising that he only managed a handful of games before going back to Italy. 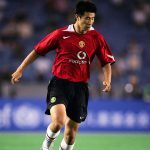 His time in Dubai coincided with a period of deep personal grief and he has since gone on record to state that the only time he truly considered hanging up his boots was during this spell. The move back home was an attempt to recapture something that had been lost along the way. He decided to return to Fiorentina and it’s easy to see why he chose there – Florence had proven fertile ground for Toni before, so where better to try to regenerate? His homecoming was a sweet one, scoring on his debut as a substitute. It was a short-lived joy however, as he was unable to translate that into more sustained success and, come the end of that season, he found himself once again without a club. Needless to say, no-one was expecting much from either Toni or Hellas Verona when he signed for them in 2013. Verona were newly-promoted to Serie A and it had been five years since the striker had registered double figures in the goals tally for the season. But something just clicked. He was back to his best, boisterously bulldozing defenders, prowling the 18-yard box and gobbling up chances greedily. He was back to scoring goals, important goals, goals to win games. At 37 he finished with 20 of them, the second highest for anyone in Serie A. It was remarkable and there were calls – serious, well-justified calls – for Toni to be included in Cesare Prandelli’s squad for the 2014 World Cup, eight years after their triumph in Germany. To his credit, he was circumspect, acknowledging that while it would be an honour to go, he was under no delusions that his age counted against him. It wasn’t to be, but Italy could possibly have benefited from his experience and leadership at the tournament. His season with Hellas was not to be a one-off. Staggeringly, he still had more in the tank and managed to improve upon his impressive tally the season before. At times he defied belief and he was scintillating to watch. The act of goalscoring is often couched in the language of precision. You have ‘marksmen’, ‘sharpshooters’, and ‘poachers’ who are ‘clinical’ finishers: terms suggesting the necessity of accuracy and calculation. Such epithets fail to capture Luca Toni’s approach to his craft. Watching him is more akin to seeing someone perform surgery with a wooden spoon – a delicate act carried out by a thoroughly blunt instrument. Yet somehow it’s wildly effective. His technique is ugly – swinging a wrecking ball of a left foot at a bouncing ball, nudging home a near post cross with his studs, shouldering home corners – so why choose placement when power will suffice? You can see why it took him so long to reach the highest level and you can understand how he could have been overlooked by scouts or coaches. At times he bludgeons his way through defences, the ball bobbling off his shins, carrying himself with all the grace of a cow falling down the stairs. At others, he’s a hulking mass with flailing limbs with only a limited sense of control over them . And yet, there is a beauty in his brutality, seeing this unorthodox force dismantling the cuckoo-clock-precise Italian defences. There seems to be something about Italian forwards that means that they can keep going on forever. Totti. Di Natale. Del Piero. Inzaghi; all managed to score goals well into their late-30s in Serie A. All masters in their own right, but Toni managed to surpass them, becoming the oldest player to win the Capocannoniere at the age of 38 in what will prove to be his penultimate season. It’s difficult to put your finger on why Serie A is so conducive to longevity. It could be the decidedly tactically-minded league or that the generally more defensive approach slows the tempo of the game down, allowing those with ageing legs but agile minds to flourish. After all, none of the aforementioned players were ever-blessed with blistering pace; they were all intelligent exploiters of space, able to bamboozle opponents with the speed of their thinking. What separates Luca Toni from the others is that he has managed to achieve this long lifespan despite being a bit of a journeyman. The rest of them were well-established at their respective clubs, immutable fixtures in places where they had long since laid down roots. That Toni managed it while being rootless makes it all the more admirable. His retirement marks the end of not only of a remarkable career, but of a whole breed of striker. He is a talismanic forward in every sense of the word. As the focal point for his team’s attacks, brushing off defenders to hold up the ball, he acts almost as an object through which a system of thought is channeled – a token of worship. Simultaneously, he seems to be a relic of an outdated and discredited ideology. In a world where forwards are the first line of defence, where high-intensity pressing and sharp bursts of energy are a prerequisite for strikers, there seems to be little room for players in the mould of Luca Toni. Ill-equipped for a fast-paced counterattack, unlikely to trouble defenders in behind – his domain is the 18-yard box and little outside it. As the game moves further away from this mould, Toni’s late renaissance at Hellas serves as a reminder of the way things were and it’s a pleasant surprise to see his re-emergence. Although, perhaps we shouldn’t be so surprised – after all, he’s hardly the first person to find their perfect match in fair Verona. Admittedly the end of his story has been a significantly happier one.